Post summary: Code examples how to create RESTful API with Node.js using Express web framework and then run it on Docker. Node.js project is created with npm init, which guides you through a wizard with several questions. In the end package.json file is created. This is the file with all your project’s configuration. Express is a web framework for Node.js. It is the most used one. In order to use express it has to be added as a dependency and saved to package.json file. Change app.js in order to verify Express is working correctly. The ‘use strict’ literal is used for enabling ECMAScript 5 strict mode, which has several restrictions, like warnings are thrown as errors, usage of undeclared variables is prohibited, etc. I would prefer using constants declared with const whenever possible. Express module is assigned to express variable with require(‘express’) directive. Then new express object is created and assigned to app variable. HTTP GET endpoint that listens to ‘/’ is configured with app.get(path, callback) function. Callback is a function that is called inside another function, in our case inside get() function. In the current example, callback has arguments req and res which gives you access to Express’ Request and Response objects. What is done below is that send([body]) function on the response is called, which returns the result. Socket that listens for incoming connections is started with app.listen(path, [callback]) function. More details can be found in Express API reference documentation. If you run with npm start you should see Server is up! text. Firing GET request to http://localhost:3000 should return Hello World! response. Functionality is a sample Person service that is used also in Build a RESTful stub server with Dropwizard and Build a REST API with .NET Core 2 and run it on Docker Linux container posts. The first step is to include body-parser, an Express middleware which parses request body and makes it available as an object in req.body property. Express middleware is series of function calls that have access to req and res objects. Middleware is used in our application. I will explain as much as possible, if you are interested in more details you can read in Express using middleware documentation. A standard model class or POJO is needed in order to transfer and process JSON data. It is standard ECMAScript 6 Person class with constructor which is then exported as a module with module.exports = Person. In initial example routes and their handling was done with app.get(), here express.Router is used. It is complete middleware routing system. See more in Express routing documentation. Router class is imported const Router = require(‘express’) and new instance is created const router = new Router(). Registering path handlers is same as in application. There are get(), post(), etc., functions resp. for GET and POST requests. Specific when using the router is that it should be registered as application middleware with app.use(‘/person’, router). This makes router handle all defined in it paths which are now under /person base path. Current route configuration is defined as a function with name getPersonRoutes which takes app as an argument. This function is exported as a module. Important bit here is require(‘./routes/personRoutes’)(app) which uses getPersonRoutes function and registers person routes. 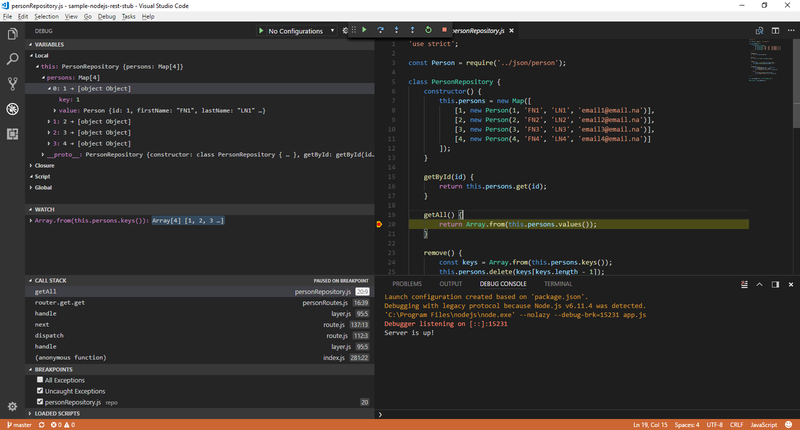 I started to like Visual Studio Code – an open source multi-platform editor maintained by Microsoft. Once project folder is imported, hitting F5 starts to debug on the project. External configuration from a file is a must for every serious application, so this also has to be handled. A separate config.js file is keeping the configuration and exposing it as a module. 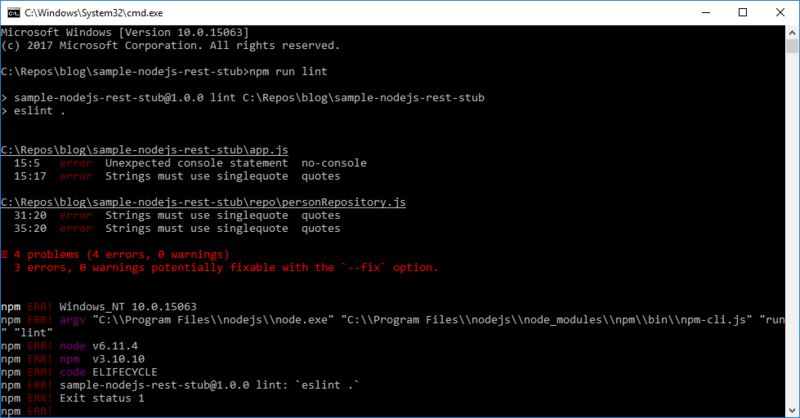 There is versionRoutes.js file added which is reading configuration value and exposing it to the API. It follows the same pattern as personRoutes.js, but it has config as function argument as well. Also, app.js has to be changed, import config and pass it to getVersionRoutes function. Notice the –save-dev option, this creates a new devDependencies node in package.json. This means that project needs this packages, but just for development. Those dependencies will not be available if someone is importing your project. Entry in scripts node in package.json file can be added: “lint”: “eslint .”. This will allow you to run ESLint with npm run lint. ESLint configuration is present in .eslintrc file. In .eslintignore are listed folders to be skipped during the check. During the check, some issues were found. One of the issues is that console.log() is not allowed. This is a pretty good rule as all logging should be done to some specific logger, but in our case, we need app.js to have text showing that server is up. In order to ignore this error /* eslint-disable */ comment can be used, see app.js above. Docker container that is used is node:8.6-alpine. Folder /usr/src/app and is made current working directory. 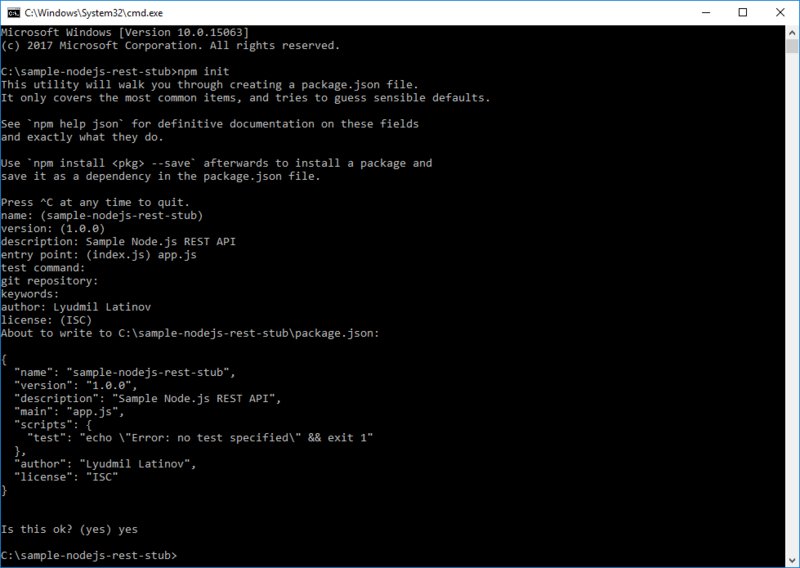 Then package.json file is copied into container and npm install is run, this will download all dependencies. All files from the current folder are copied on docker image with: COPY . .. Port 3000 is exposed so it is, later on, available from the container. With CMD is configured the command that is run when the container is started. Notice the -e VERSION=1.1 which sets an environment variable to be used inside the container. The intention is to use this variable in the application. This can be enabled with modifying config.js file by changing to: version: process.env.VERSION || ‘1.0’. If environment variable VERSION is available then save it in version, if not use 1.0. If invoked now /api/version returns 1.1. In the current post, I have shown how to make very basic REST API with Node.js and Express. It can be very easy run on Docker container.